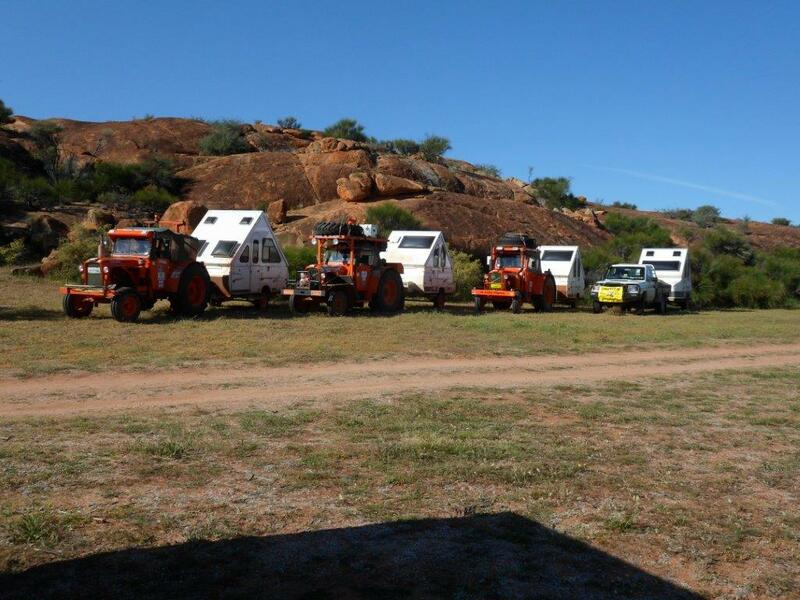 The Holland Track trek got off to a great start when the trekkers all met at Hyden on the 6th August 2014. The first camp fire was lit up at the Wave Rock Caravan Park and it wasn’t long before everyone slipped into holiday mode, eating, drinking and a few good jokes which had everyone laughing. 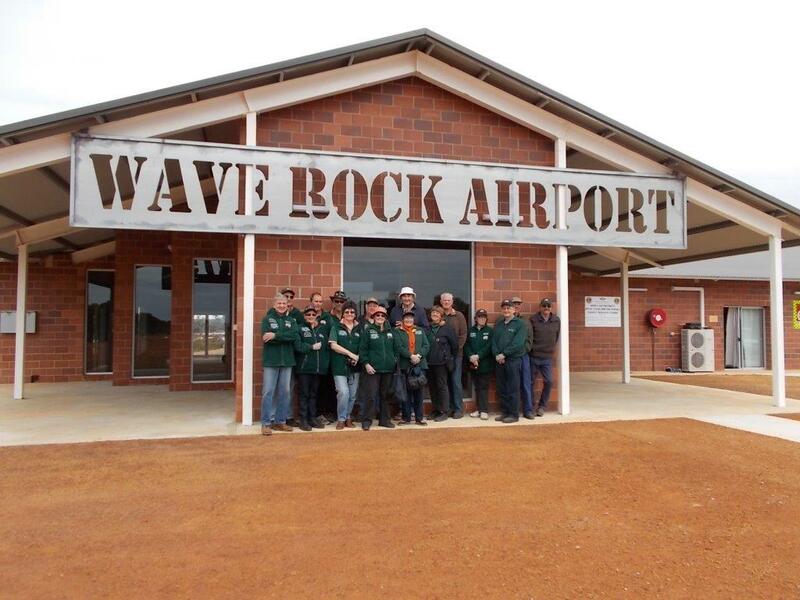 Before leaving the following day we were all invited to take a bus tour to the new Flying Doctor Patient Transfer Station at the Hyden airstrip. We were fortunate to have as our guide Pat Unstead and their bus driver, John Collins (from the local Lions Club). We also visited the Resort, Amphitheatre, Salt Lake and Hotel/Motel. Our thanks to Pat and John for making this tour possible along with their interesting commentary provided along the way. 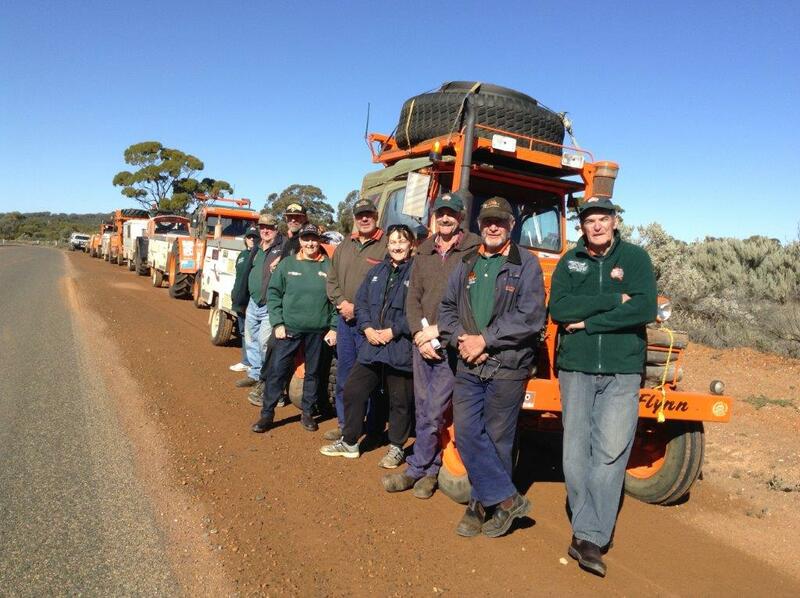 We commenced the trek with 5 tractors and 6 support vehicles. After camping at Lake Carmody, one group left early the next morning to travel on the Holland Track and the others took the alternative route, the Holland Way. Those who travelled along the Holland Track enjoyed the adventure and, fortunately, did not encounter any problems, and likewise for those who took the alternative route. While travelling along the Holland Way we camped at the Breakaways which was an impressive rock formation and excellent camping area. On the 9th we visited (and climbed) McDermid Rock, a picturesque picnic area. After lunch at Lake Johnson we continued on to camp at the intersection of Holland Track and Victoria Springs Road. We met up with the other group when they came off the Holland Track. Lots of conversation around the camp fire that night catching up on all the events of the previous two days. 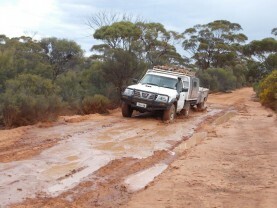 We left camp on Sunday 10th to travel across to Cave Hill along Cave Hill Road, which was quite rough in patches. Cave Hill was quite a spectacular rock formation as well. 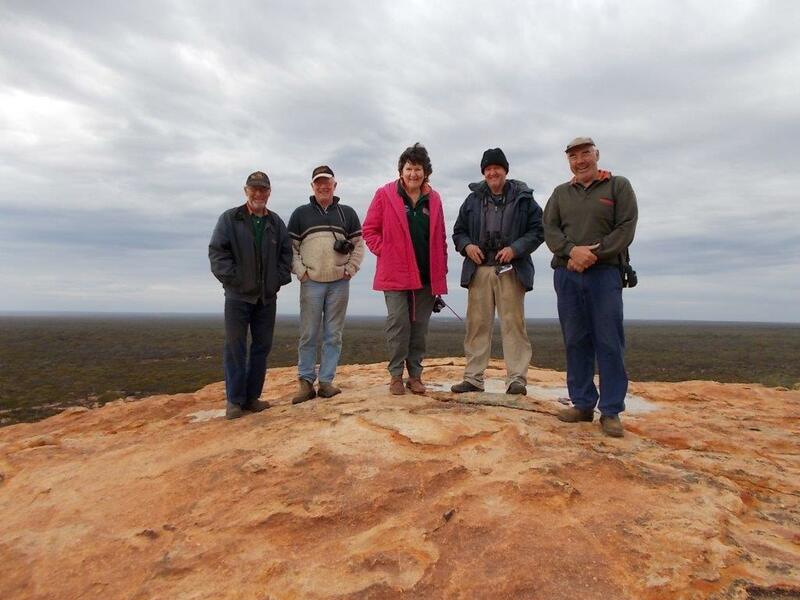 After lunch we continued on to Burra Rock where we camped for the night. The following morning before leaving the camp site we all climbed the rock and had a good look around. 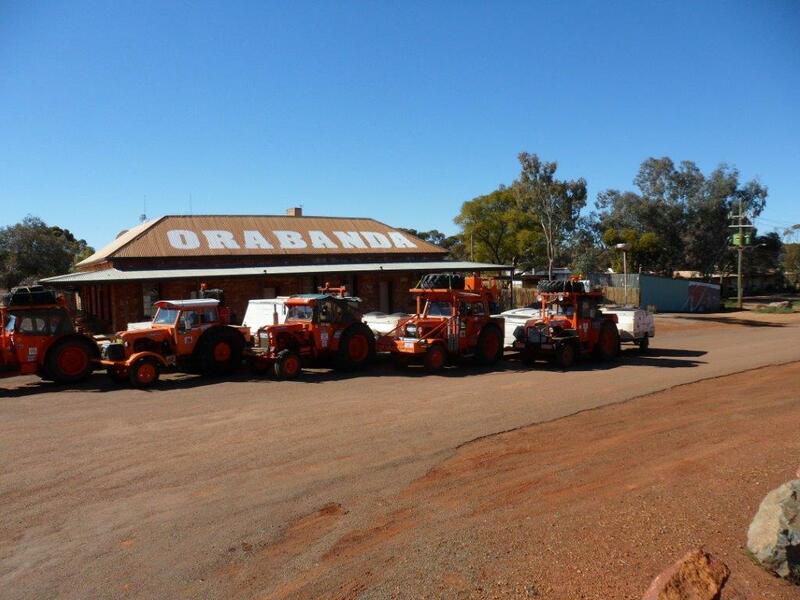 Our next destination after Burra Rock was Coolgardie. We stayed for two nights at the local caravan park. This was a good opportunity to visit the tourist spots around the town and also time to replenish our supplies. Our fundraising in Coolgardie was very successful during our stay. 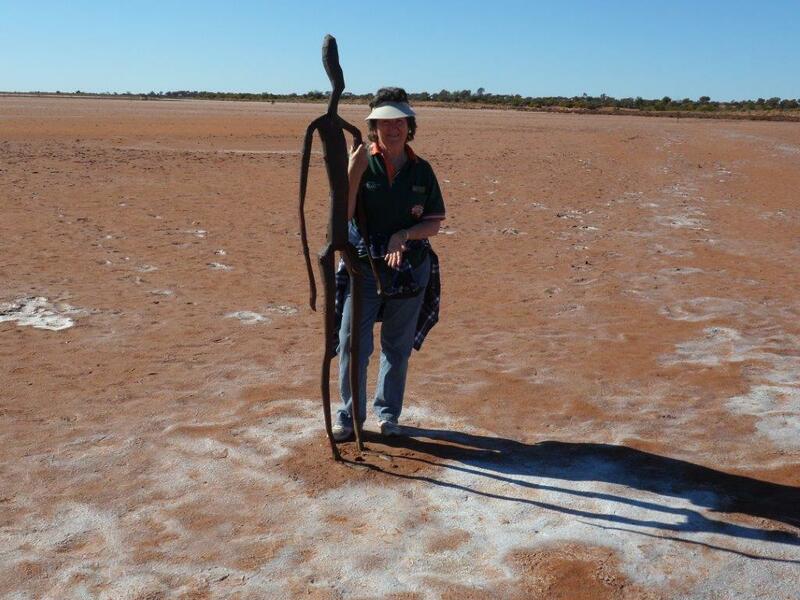 We left Coolgardie on the 13th and, after passing by the remnants of two former townsites – (Kunanaling and Kintore), we arrived at our next camp site at Rowles Lagoon. This was an excellent camp site alongside the lake. 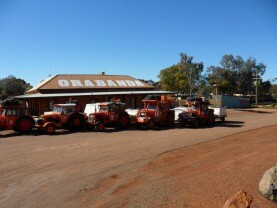 The following morning we travelled to Ora Banda for lunch, via the Golden Quest Discovery Trail. We continued on to a campsite in the Davyhurst area. 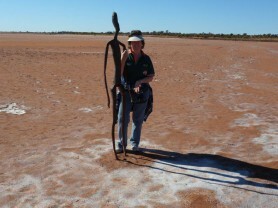 We left the following morning, heading for Lake Ballard. 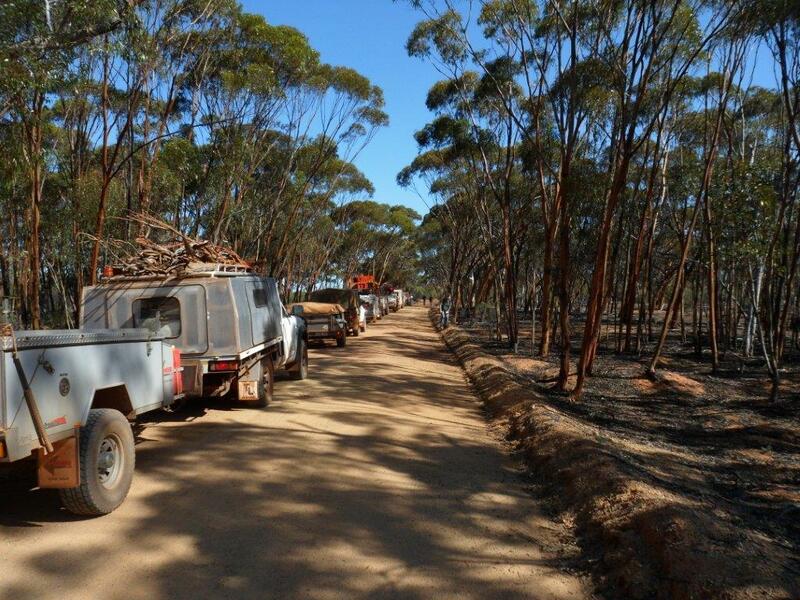 We had only travelled a few kilometres when one of the tractors had problems with a head gasket so was towed back to the camp site so repairs could be carried out. The tractor was parked up on an old concrete slab which made it easier to carry out the repairs required. 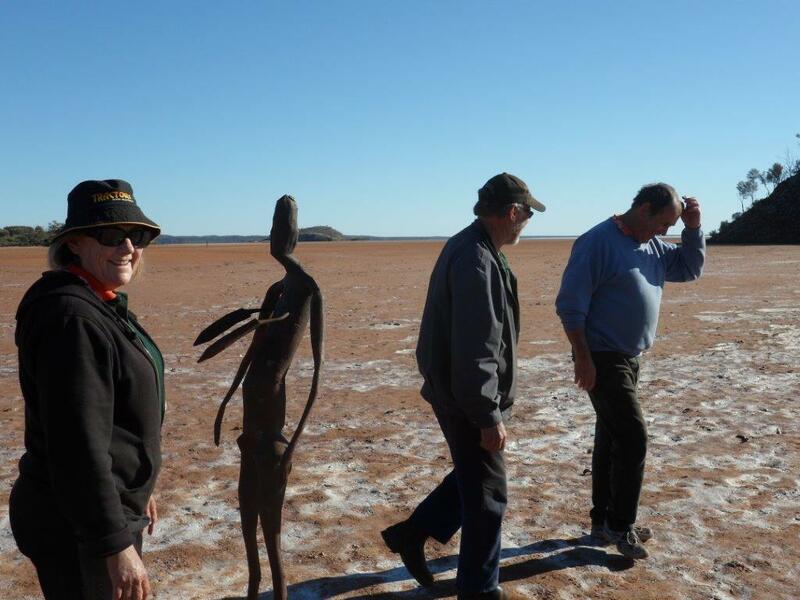 Everyone returned to assist with the repairs (which were successful), and following lunch we all headed off again for Lake Ballard. 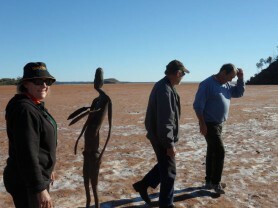 For those who had not visited Lake Ballard before, it was an opportunity to view the sculptures scattered around the lake and take in the view from ‘the hill’. 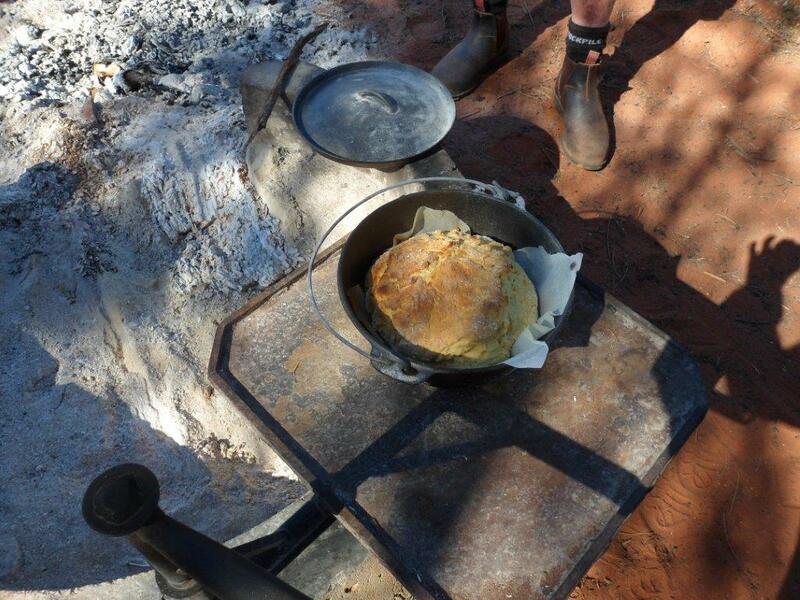 This was another relaxing camp with a good camp fire with some of Brenda’s damper to share around. 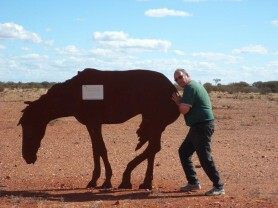 The following day we travelled to Menzies where we were booked in to stay at the local caravan park. 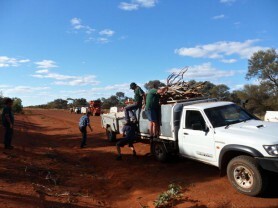 The Menzies Council held a welcome BBQ for the Tractor Club to which members from the community were invited to attend. Brenda sang a couple of songs and Allan spoke for a few minutes about the purpose of the Chamberlain 9G Tractor Club and the fundraising that is carried out during our travels. This was a very successful evening and the members appreciated the hospitality shown by the Menzies community. 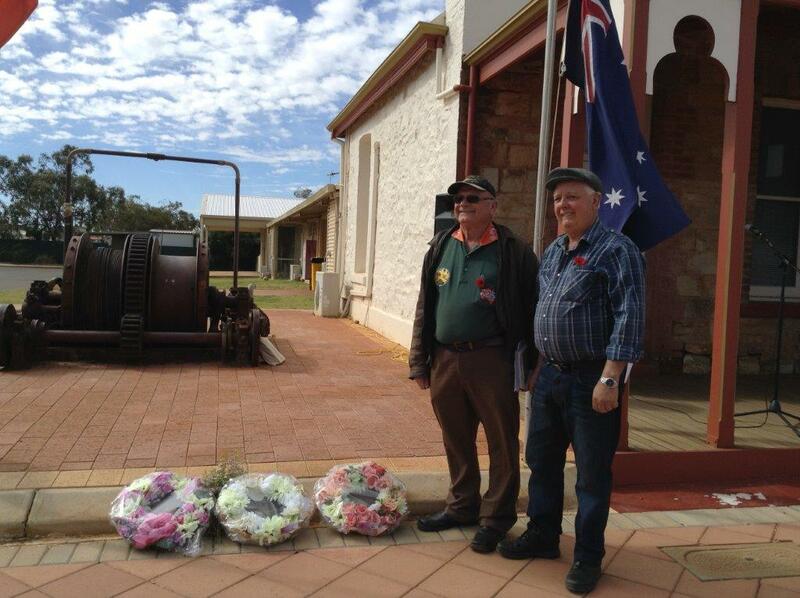 The following morning we all attended the Vietnam Veteran’s Commemoration Service. The service was well attended and two trekkers, who are both Vietnam Veterans, were invited to participate in the ceremony. A wreath was laid on behalf of the Tractor Club. Harry James, Vietnam Veteran and Member of the trekking group, read this poem at the Memorial Service on August 18th. It had to happen to such a decent bloke. To me somehow it doesn’t quite seem fair. Whose life amounts to ten times what mine’s worth. We can’t just blame it all on His great plan. And destroy each other with our endless wars. He’s got to grit his teeth and carry on. So how’s a bloke supposed to deal with this? When they teach you how to play the soldier’s game. How to live with the loss of a real good mate. Due to an unexpected thunder storm, some roads in the area were closed so we had to take an alternative route from Menzies via Leonora. 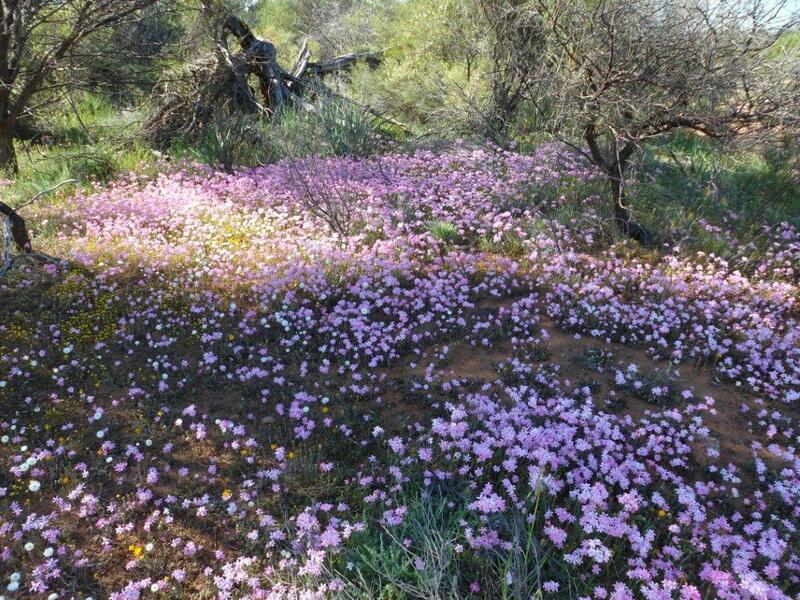 We continued along Agnew Road and camped alongside a river bed, then the next day stopped off at the Agnew Hotel which is now abandoned. We had lunch at Sandstone then continued to the next bush camp at Youanmi. 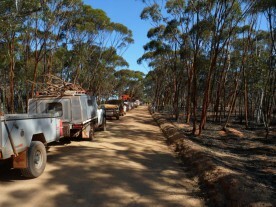 Arrived at Payne’s Find the following morning and joined a tour through the gold mine battery. This is the only private family company still supplying the Perth Mint with gold. All other batteries are government owned. Our next destination was Bimbidji Station. We received a very warm welcome from station owner Tania. Here we enjoyed a sheep on a spit around the camp fire. Prior to arriving at the station most members had read a booklet on the history of the station written by the previous owner of Bimbidji and this made our visit all the more interesting. We left the station on the morning of the 23rd August and headed for our last camp out at Billiburning Rock, a lovely camp site and plenty of time to walk and explore the rocky outcrop. Kalannie Caravan Park was our next stop and while in town for two days we made the most of the laundry facilities and shopping to top up food supplies. We all enjoyed two evening meals at the local club, visited the Hathaway Farm to view the tractor museum and also had a tour through the Mammoth Equipment and Exhaust factory. Those members with tractors also visited the school. 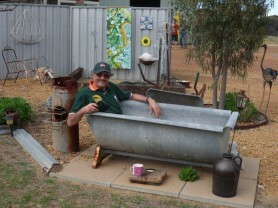 We left Kalannie and called in to the Purple Haze museum/craft shed at Burakin for morning tea. After wandering through the garden/museum, purchasing some craft, and taking several photos we continued on our way to Dowerin. 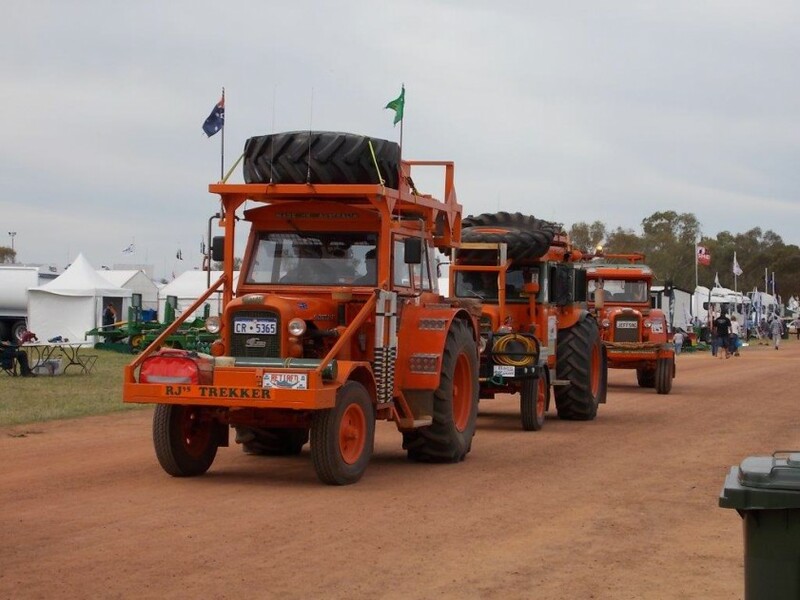 Once in Dowerin we were joined by several more Tractor Club members with their tractors which were on display for the two days of the show and also took part in the grand parade. 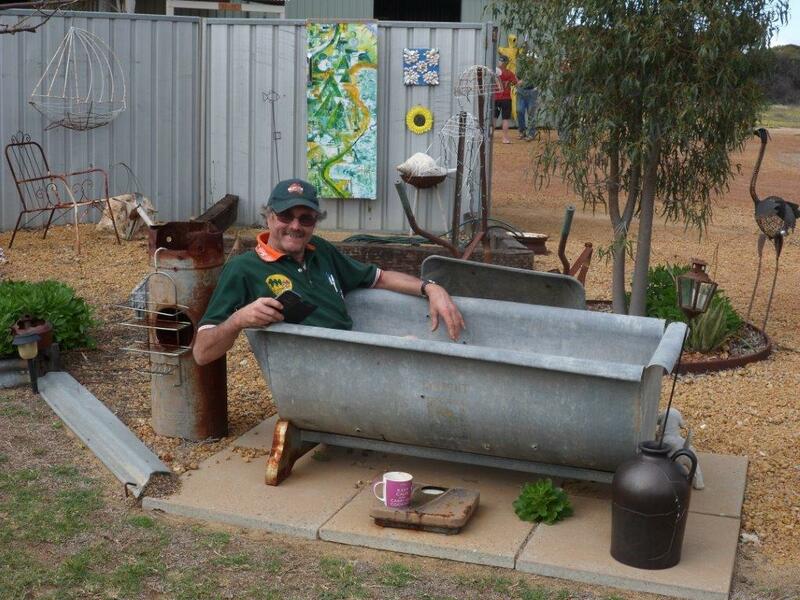 This was the 50th anniversary of the Dowerin Field Days and the Club was pleased to be able to participate. 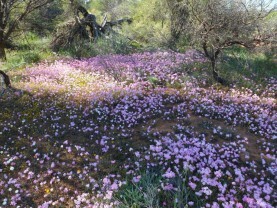 This was a very relaxed and social trek and well timed to take in many beautiful displays of wildflowers.